We celebrated Mass at home and then hit the road right afterwards. On the way, we stopped at a Discalced Carmelites’ Convent in Tricio, located in the province of La Rioja. They let us eat in their parlor before being meeting with them. For dessert, they gave us grapes and pears from their garden. As we were eating, their chaplain, who knows Fr. Rafael, arrived and took us to see a Paleo-Christian hermitage. It turns out that Tricio, a Roman village, has been Christian since the 2nd century. The chaplain explained that Saint Paul sent an image of Our Lady to this hermitage. 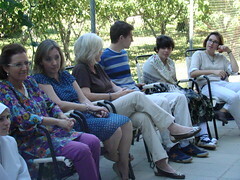 Later on, we went back to the convent and were able to meet with the Carmelites. They asked us about WYD and we told them all the work that the Sisters had done and our experiences at the Prayer Vigil with the Pope. We then left for Zaragoza, where Curro, a lay member of the Home of the Mother, warmly received us. 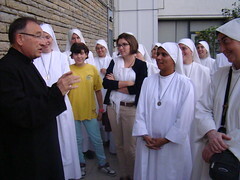 He introduced us to the comunity of Dominican Mothers, who belong to the same community of Domincans as those who are very generously letting the Servant Sisters use their convent in Valencia. After meeting the sisters, we followed our tourguides, Carmen and Marta Oria, in order to see the Basilica of Our Lady of the Pillar. The city was already crowded with a sea of people who had come to celebrate Our Lady of the Pillar’s feast day. We arrived at the basilica when the Prayer Vigil with the bishop was ending. Seeing our chance, we went and kissed the pillar where Our Lady is said to have appeared to St. James. 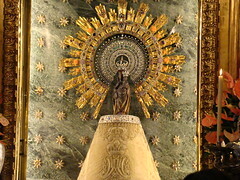 Afterwards, we went to see the image of Our Lady, where there was a lot of people praying. We were told that the bishop was going to come there to sing the Salve Regina and, as Our Lady loves us a whole lot, she opened up the way so that we could get even closer to her image. We knelt down in the front line, where we prayed for the Home of the Mother. The next day, we recited morning prayer and were able to pray a little while with the Dominicans and then later we left with Marta and Carmen to see the floral offering. 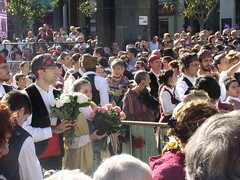 This act consists of people from Aragon and other Spanish regions who dress in traditional garments in order to bring a gift of flowers to Our Lady. There were more than 400,000 families present. Throughout the day, people bring flowers to Our Lady, they sing to her, and they dance a folk dance called the “jota” in her honor. It was amazing! We also saw the perpetual adoration chapel located downtown, along with the cathedral and basilica. While we were visiting the basilica, a worried man came up to us, asking us where he could go to confession. As Father saw that the confessional lines were very long, he took the man aside to hear his confession. Father realized afterwards that Our Lady had unexpectedly brought him to Zaragoza so that that man’s soul could receive the Lord’s forgiveness after having been many years without receiving this sacrament. 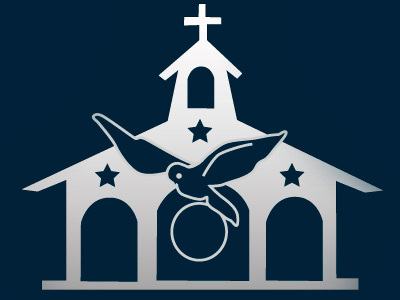 After having returned to the Dominican convent to eat lunch with families of the Home of the Mother, we had a small reunion and then celebrated mass. When mass had ended, we said goodbye to the familes and the Dominican nuns and then we headed back to Zurita. We are very grateful to Our Lady for all that we lived. Long live Our Lady of the Pillar!